A flowchart is a common type of diagram, that represents an algorithm or process, showing the steps as boxes of various kinds, and their order by connecting these with arrows. Flowcharts are used in analyzing, designing, documenting or managing a process or program in various fields. There are a bunch of these floating around the internet in relation to songs. 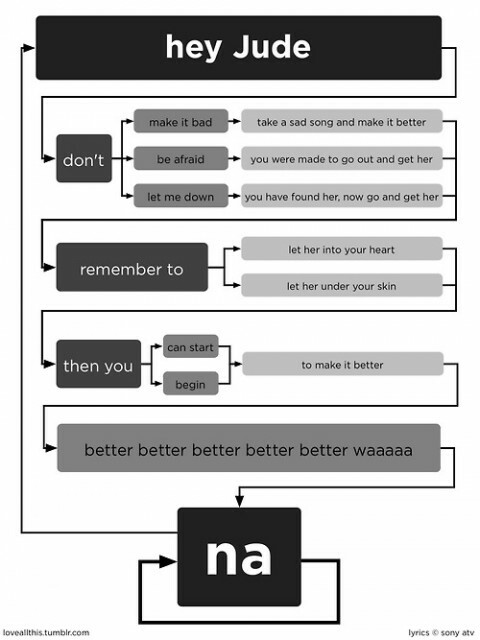 Here is The Beatles “Hey Jude” in a flowchart.